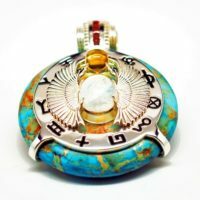 It only seemed appropriate to pair the talisman of kings, shamans and warriors with a center stone representative of new beginnings to adorn this powerful and restorative Egyptian Scarab Amulet. 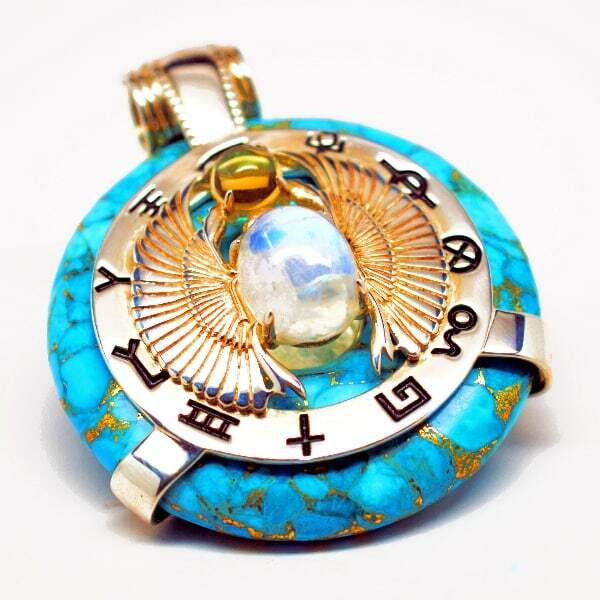 If you are looking to unblock, balance and awaken the solar plexus, throat or third eye chakra, there’s no better tool than the quantum infused Turquoise w/Moonstone and Citrine Scarab pendant to propel your efforts. 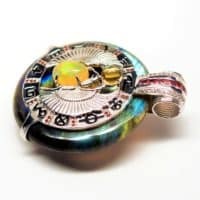 Associated with the Egyptian Neter Khepri, the scarab beetle represents divine wisdom, rejuvenation, immortality and is a protector and restorer of life. 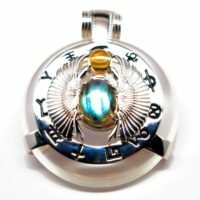 Allow the scarab and the combination of protective stones and harmonic frequencies guide your mind, body and spirit healing journey to divine wisdom. 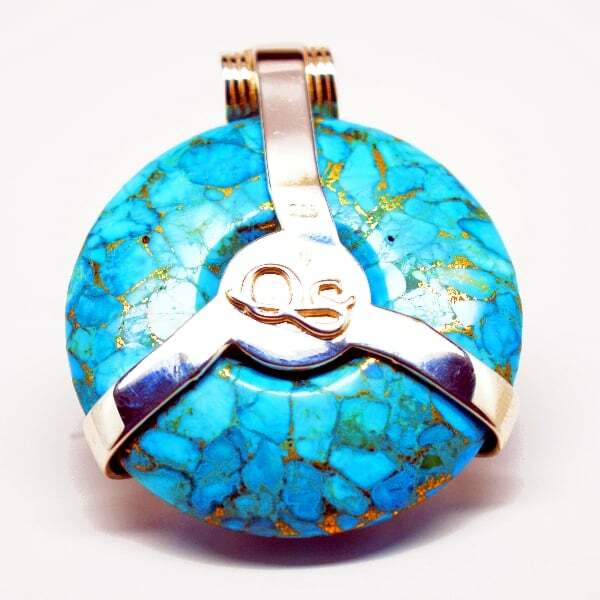 Turquoise aids in truthful communication to allow one to reclaim their power by speaking their truth from the heart and mind. 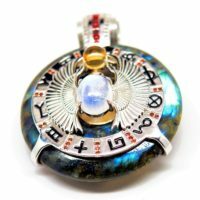 This legendary stone frees individuals of baggage and fears while boosting confidence and trust as they let their intuition guide them through earthly and spiritual planes. 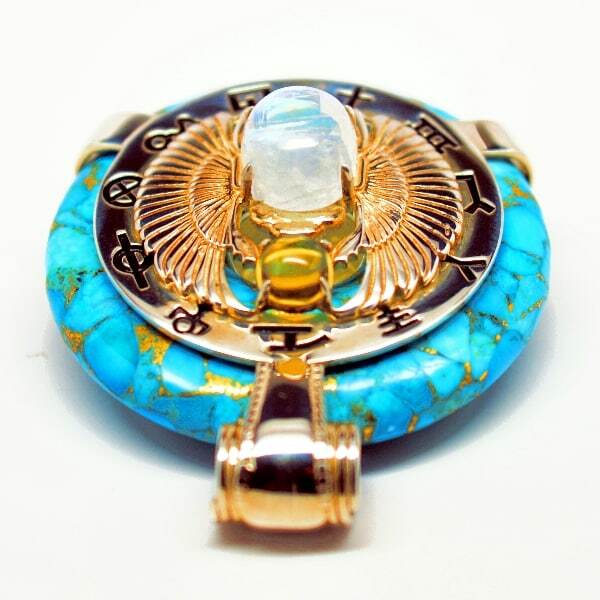 While the scarab ‘rolls’ in a round citrine filled with clarity and creativity, its moonstone body helps relieve stress, stabilize emotions, and promotes inner growth and strength. 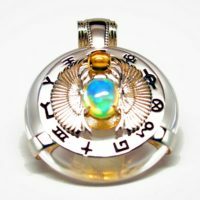 It activates the pineal gland for greater spiritual receptivity, preparing one for a journey of rebirth, growth and resurrection. 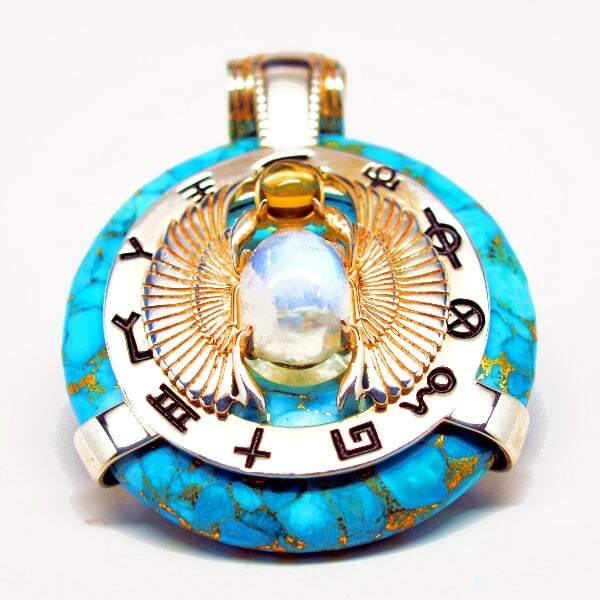 Promote your healing intentions even more by enhancing your experience by pairing this stone with one of our Sekhmet Pure Egyptian Sacred Essential Oils such as Amber Kashmir, Musk, or Sandalwood. 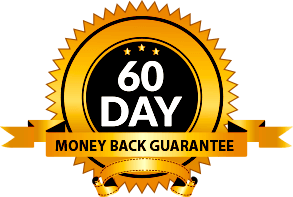 Step 2: Optional - Extra Frequencies ? 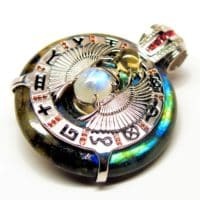 We’ve magnified the power and vibrational resonance of this healing tool in numerous ways. 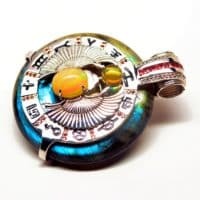 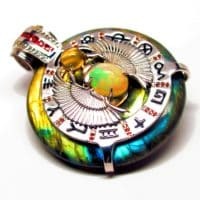 Behind the mighty scarab are healing energies, and we also surrounded the front with 11 meaningful Tarot symbols that further promote prosperity, illumination, divine wisdom and protection from negative energies and harmful EMFs. 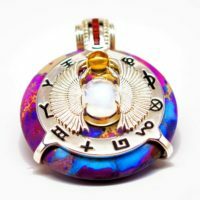 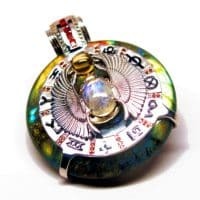 For a nominal cost you can customize and upgrade your amulet with up to 3 additional frequencies. 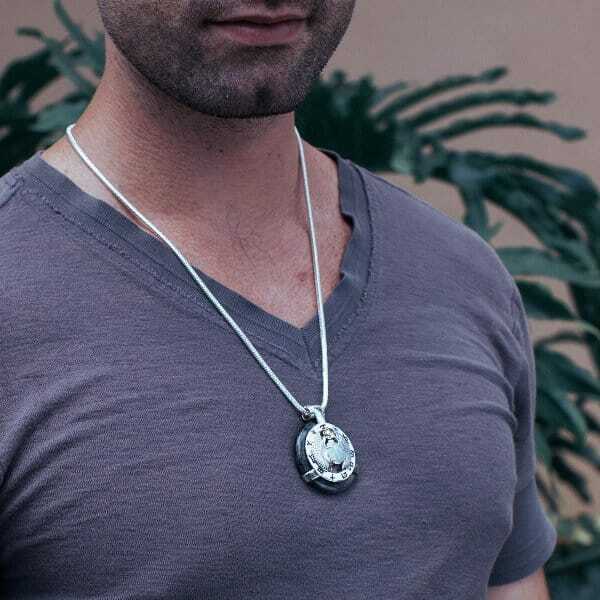 Included with every pendant is a leather cord or stainless steel rope chain in your choice of length (22, 24, or 26 in.) 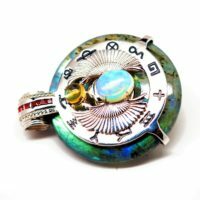 along with a stylish case, gift box and polishing cloth. 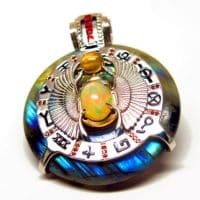 Chakra Soul Issues: To feel free to speak honestly and openly to trust the soul to speak the truth. Be the first to review “Turquoise w/ Moonstone Body – Scarab Egyptian Amulet” Click here to cancel reply.